The history of Mooseheart Child City & School is inextricably intertwined with that of the Loyal Order of Moose and the Women of the Moose, two organizations whose stupendous growth during the first quarter of the 20th century was inspired by the idea of creating this beautiful home and community for children in need. James J. Davis – who later would serve as Secretary of Labor to three Presidents, then 14 years in the U.S. Senate – agreed late in 1906 to take on the job of recruiting members into the then-faltering Moose organization, on the basis of eventually using members’ pooled resources to create a home and school where dependent widows of Moose members could take their children. It is James J. Davis (right) who is duly honored as Mooseheart’s founder, for he conceived the Child City concept—and tirelessly sold hundreds of thousands of men on the idea. But it was Rodney Brandon (left) who built the place, guiding the campus’ planning, construction, staffing and program for its first three years. In late 1912, the Moose Supreme Council approved the purchase of what was known as Brookline Farm, nearly 1,000 acres west of the Fox River along the dirt-surfaced Lincoln Highway. What is now Minnesota Home on the Mooseheart campus was originally dubbed Purity Hall; the high-school age girls who lived there upon its completion in 1915 began their mornings with calisthenics. By the time this aerial photo was taken in 1933, many of today’s established Mooseheart landmarks were in place, notably the Campanile. With the Depression setting in, only the football stadium would be built between this point and the end of World War II. The center court of the five-building Baby Village complex was originally built in 1922 with a formal concrete fountain (left); by 1940 (right) the fountain had been replaced by a much more practical (and fun!) wading pool. The fraternity’s Nine O’Clock Ceremony was first depicted in oil for distribution to Lodges in the early 1930s, with a Mooseheart child saying a bedtime prayer with the Campanile tower shown outside the window; the painting was updated in the early 1960s, now the House of God is depicted at dusk outside the window. By the 1940s Mooseheart’s front entrance, off Illinois Route 31 (formerly Lincoln Highway), had been paved for many years and was graced with mature trees. The concrete column at the entrance had been a gift from the Class of 1929. Within five years – by late 1911 – the organization had grown to membership of nearly 200,000, and Davis, now carrying the title “Director General,” recommended that Moose leaders begin seeking the right parcel of real estate to set about establishing the so-called “Moose Institute.” The decision was ratified by the Convention, and once it became generally known, property offers swiftly came in from various parts of the United States. For an entire week in December 1911, a joint meeting of the Moose Supreme Council and newly-appointed Trustees of the Moose Institute met at the Willard Hotel in Washington to closely examine all offers. Dedication of Mooseheart was set for Sunday, July 27, 1913—the day before the opening of the 25th International Convention in Cincinnati. Thomas Marshall, then newly installed as Vice President of the United States, first balked at Supreme Governor Ralph Donges’s invitation to speak at a ceremony for what he viewed as an “orphanage.” Donges responded that “what we are planning will not be an orphanage at all. It will be a home and school for the children of our deceased members. 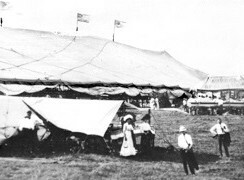 On its dedication day Mooseheart featured a large farmhouse dubbed Aid Hall, a few other ramshackle buildings, and a huge circus tent rented from Ringling Bros. for the occasion, to shield the gathering from the summer sun. Most importantly, there were 11 children present who would be the first to call Mooseheart home—the vanguard for more than 11,000 more who have lived and learned over more than 90 years at the at the Child City. In August 1913, Supreme Secretary Rodney Brandon moved from Anderson, IN, where Moose headquarters had been located, to Mooseheart, to serve as the community’s first Superintendent. He brought with him Dr. J. A. Rondthaler, a Presbyterian minister and former college professor, whom as Dean took charge of students’ home life and schooling. Under Brandon’s direction, the future design of Mooseheart began to take shape. James A. Young, city forester for nearby Aurora and owner of a nursery there, contributed landscape design services on a part-time basis. It was Young who also drew basic plans for a Mooseheart street layout, which he made roughly in the shape of a stylized heart. 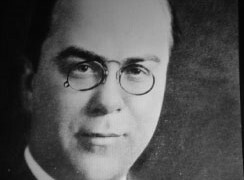 Robert Havlik, a young civil engineer from Detroit, was hired in November 1913 to handle all construction of streets, utilities and permanent buildings. Brandon also rehired R.R. Luman, who had served as farm superintendent for Brookline’s previous owner. An Aurora physician was retained on a part-time basis to oversee an on-campus nurse and administer to health needs. The pace of construction was feverish throughout Mooseheart’s first 10 years, but especially its first five. The current U.S. Post Office building (which then was also a railroad station and Mooseheart offices) was begun before the end of 1913. A complete water and sewer system was installed during the spring and summer of 1914, along with a coal-fired heating plant and steam lines. Rail carloads of elm trees were planted on the residential portion of the mostly bare campus (Many had to be replanted with other species 40 years later, when Dutch elm disease struck throughout the Midwest). A major boys’ dormitory, Loyalty Hall, and girls’ dormitory, Purity Hall (now Minnesota Home) were both built in 1914. Sixteen other buildings – residential and vocational structures, and a new school building – were completed between 1915 and 1918. The massive Administration/Auditorium Building, named for former President Theodore Roosevelt, was completed in 1918 and after having been begun in 1914. Mooseheart’s continued development continued unabated during the 1920s; the famed five-structure Baby Village and the Campanile, an homage to James J. Davis, were both completed in 1922; 15 more residences were built before 1930. The Great Depression hit the Moose fraternity hard; membership plummeted from 600,000 to less than 250,000 in just seven years. Meanwhile, Mooseheart bore the responsibility for the largest population of children and teens it would ever have, flirting with the 1,400 mark throughout the 1930s. Between 1933 and the end of World War II, the only new Mooseheart structure built was its new football and track stadium in 1940, a gift from the Illinois Moose Association. Raising the funds for that, and designing it for no fee, was engineer Wayne Wallace of Chicago—a member of Mooseheart’s first graduating class in 1919. The end of World War II saw one of America’s greatest honors bestowed on a Mooseheart graduate: U.S. Army Lt. Edward Silk, of the Mooseheart Class of 1935, was presented in October 1945 with the Congressional Medal of Honor from President Harry Truman, for valor and cunning in single-handedly forcing the surrender of a dozen enemy soldiers in France the year before. With the end of the war came long-postponed renovation and construction at Mooseheart, highlighted by the magnificent multi-denominational House of God, built in 1948-50 after a fundraising drive that had begun more than 30 years before. The Malcolm R. Giles School building, now housing elementary through high school students in two separate wings, was dedicated in 1954 and added onto in 1963 and 1965. Pennsylvania Home, designed to resemble Philadelphia’s Independence Hall, was dedicated in 1958. At Mooseheart’s 50th anniversary celebration in 1963, the cavernous new Mooseheart Fieldhouse, attached to Illinois Memorial Stadium, was opened. Up through the early 1960s, the original admission policy to Mooseheart remained largely unchanged, permitting only children of male Moose members who had died. As society changed swiftly throughout the 1960s, ’70s and ’80s, Mooseheart adjusted in response, steadily accepting more and more children whose families were in disarray due to divorce, substance abuse, severe economic reversal, or other reasons. Until 1994, however, admission generally required that there be a Moose member in a child’s extended family. But that year, the Moose fraternity’s leaders voted unanimously to expand the admissions policy to consider applications from any family in need, regardless of whether a Moose member was a part of their extended family. The 1980s and ’90s saw sweeping changes also in Mooseheart’s time-honored vocational-training program – unique at the time of the campus’ founding, and swiftly emulated by Boys Town in Nebraska and other similar facilities. Upon high school graduation, each Mooseheart student still receives both an academic diploma – and a certificate of proficiency in a trade, For decades, vocational training had taken place completely on campus in more than a dozen different trades. Training still occurs on-campus in Small Engines and Machines, Cosmetology/Hairstyling, Family and Consumer Science, Management Information Systems, Health Occupations and Banking. More recently, more flexible “co-op” vocational training arrangements have been established off-campus with numerous industries and retailers, offering a “real-world” glimpse at various lines of work. Through the 1990s, a whirlwind of residential construction and renovation began anew at Mooseheart. Just from 1991 through 2002, beautiful brand-new residences were built and funded by the Moose of West Virginia, Illinois, Michigan, Maryland/Delaware, New Jersey and North Carolina. Additionally, full renovations of the New York, Tennessee, Washington/Northern Idaho, New England, Arizona/New Mexico, Ontario, Oregon, Iowa/Eastern Nebraska, Virginia, Alabama, South Carolina, Indiana, Minnesota, Wisconsin Georgia, and Pennsylvania Baby Village residences were undertaken. The Women of the Moose of various states and provinces were instrumental in helping fund all of the above projects; they also completely funded a full renovation of their own, as the Greater Chicago residence was renamed the Antoinette Marinello Home, honoring the woman who was the CEO of the Women of the Moose from 1979 through 1990. In 1994, the Mooseheart campus took its first step away from full financial reliance upon the Moose fraternity, when Mooseheart Child City & School was incorporated as a separate entity, a registered 501[c]3 charity under the U.S. Internal Revenue Code. In 1998, Mooseheart’s first major new multipurpose structure opened since 1963, as the Paul J. O’Hollaren Centre was dedicated, named in honor of the Moose fraternity’s Director General from 1984-1994. This meeting, reception and banquet facility was funded by portions of new-member application fees, with additional funds for landscaping and furnishings from the Moose Legion and the Women of the Moose. In 2001, the first major addition to the Mooseheart School complex since 1965 was completed – This 12,000-sq.-ft. project joined both north and south wings on their east end, and consists of the Florida/Bermuda Cafeteria, the Kay Cancie Gymnasium for physical education, and a Band Room funded by the Order’s Fellows and Pilgrims. This addition enabled an all-student-body assembly to be held within the school structure for the first time. In 2003, Mooseheart gained its youngest Executive Director since its first one, Rodney Brandon, when 34-year-old Scott D. Hart assumed the post. Hart and his wife, Christie, had been career Mooseheart staffers since coming to the campus in 1991. The new Executive Director had served as a Family Teacher, Dean, and Assistant Executive Director. In December 2012, the Moose fraternity's Supreme Council selected Hart to succeed the retiring William B. Airey as the tenth Director General/CEO of Moose International; Hart, in turn, selected Gary L. Urwiler to succeed him as Executive Director of Mooseheart—an appointment that was swiftly confirmed by the Mooseheart Board of Directors. Urwiler became the second Mooseheart alumnus to rise to lead the campus in adulthood (the first having been Robert Hanke from 1974-80). Urwiler, who had come to Mooseheart at age 12 in 1981, was graduated in 1987. He earned a bachelor's degree in education at Eureka College in 1992, and a master's degree in educational administration from Aurora University in 2001. From 1995-2000 he served Mooseheart as Dean of Students, Athletic Director head football coach; from 2003-12 he served as Superintendent of Education/Principal, and again as head football coach.